With PUBLIC designing classy, colorful and comfortable bicycles, they have made riding bikes cool again. 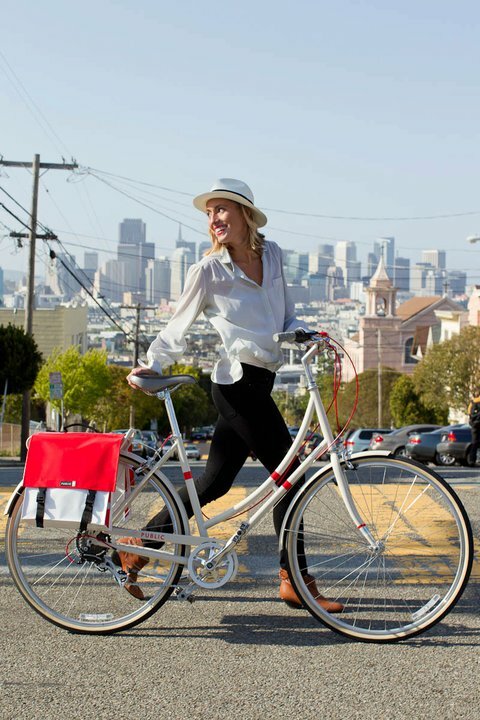 The San Francisco-based bicycle company designs with all people in mind; whether you're the type of person who enjoys riding their bike to work (and on an everyday basis)—or for the pure pleasure of it, or even for those who're just wanting to relive some childhood memories. Rob Forbes launched PUBLIC just last spring. The former Founder of Design Within Reach, was inspired when he took his first bicycle ride at the age of four. It was his neighbor Gigi, who gave him his first lesson and it was then on his first bike ride, when this bike showed him the world. If you’ve seen a bright painted bicycle and said to yourself, “Wow, I wish I had one of those!” Chances are, you’ve seen a PUBLIC bike (see featured video: Design Matters, top right) . These bikes are designed to be stylish and chic, and yet accommodating for the rider. You can wear casual clothing or business attire, as well as any type of shoes—whether you want to wear pumps, tennis shoes or even flip-flops. PUBLIC bikes' motto, “ride like butter” promises to offer a relaxing ride, whether you're headed to the office every morning, or if what you seek is a refreshing breath of fresh air, after your 9-5. PUBLIC has conceived the “Cruiser for modernists,” the PUBLIC D1 (featured left, below). This bicycle is purposed to be light—weighing in at only 26.5 pounds (with fenders and kickstand). It only has one gear and is perfect for flat lands and lightly sloping topographies. However, the D1 is also fashioned to fit bicyclists, hence, it can be ridden almost everywhere. This lightweight bike has a light steel frame that makes it easy to carry anywhere—up and down stairs, and even in the subway. The style of the bike is a classic diamond frame, which is typically used for city, touring and racing bikes. PUBLIC BIKES: D1 (Left), M8 (Right). Images via PUBLIC BIKES. Overall, PUBLIC has applied most, if not all there is to consider when it comes to urban biking into their bikes. But the best part about them yet: they have a lifetime guarantee.